In his international bestsellers Guns, Germs and Steel and Collapse, Jared Diamond transformed our understanding of what makes civilizations rise and fall. Now, in his third book in this monumental trilogy, he reveals how successful nations recover from crises while adopting selective changes -- a coping mechanism more commonly associated with individuals recovering from personal crises. 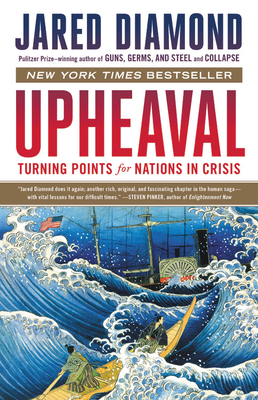 Diamond compares how six countries have survived recent upheavals -- ranging from the forced opening of Japan by U.S. Commodore Perry's fleet, to the Soviet Union's attack on Finland, to a murderous coup or countercoup in Chile and Indonesia, to the transformations of Germany and Austria after World War Two. Because Diamond has lived and spoken the language in five of these six countries, he can present gut-wrenching histories experienced firsthand. These nations coped, to varying degrees, through mechanisms such as acknowledgment of responsibility, painfully honest self-appraisal, and learning from models of other nations. Looking to the future, Diamond examines whether the United States, Japan, and the whole world are successfully coping with the grave crises they currently face. Can we learn from lessons of the past?